Colour: Shiny, golden copper colour. Fragrance: Mainly apple (so characteristic of the Pays d'Auge) with vanilla also discernible. Well-balanced. Taste: Smooth and fruity with an incomparable elegance and aromatic richness. Aftertaste : Full of personality and length. Blend : Calvados varieties of 3 to 5 years of age. 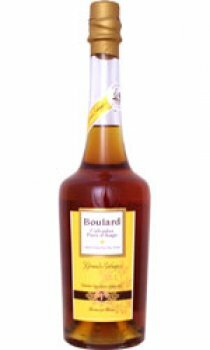 Produced from a blend of Calvados varieties from the Pays d'Auge of which the age varies from 3 to 5 years, the Boulard Grand Solage is characterised by its apple fragrance and its amber colour.